Chapter 7 Bankruptcy filings take how long to complete in Rhode Island? Let’s pretend you filed a Rhode Island Chapter 7 bankruptcy case today. If you did, your case would come to an end in about 90 days. What happens during that time? You complete your first education course on-line, or over the phone. It takes about 60 minutes and is easy. Your bankruptcy lawyer obtains a bankruptcy-specific version of your credit report. Your 50 page bankruptcy petition is filed electronically with the RI Bankruptcy Court in Providence. A Chapter 7 trustee (another lawyer) is assigned to review your petition. Your attorney sends your tax returns and pays advice information to the court/ trustee. The Bankruptcy Court Noticing Center contacts each creditor listed in your petition. You complete your second debtor education course which takes 2-3 hours. Also very easy. Once your course is completed, your attorney files a certificate of completion with the court. A 341 meeting of creditors is scheduled 30-35 days into the process. Hearings take place in Providence. You attend the meeting of creditors to answer common questions from the assigned trustee. If your property is exempt (protected), the trustee files paperwork with the court saying you have been examined and there is no property to distribute to creditors. If you have assets that are unprotected, the trustee will collect the property for later distribution to creditors. It’s easier to understand the Chapter 7 bankruptcy timeline if you divide it in thirds. If you filed your case today, you would have to attend a creditors meeting in 30 days. Then, if no creditor contests your case and your trustee doesn’t need to distribute any assets, your case is over 60 days after the hearing. I realize it is stressful to think about filing for bankruptcy. If handled correctly, however, there is nothing to worry about. I have represented more than 3,000 clients over the past 21 years. If you can answer my questions honestly and completely before the bankruptcy petition is filed, you will be amazed how fast and straightforward bankruptcy can be. I have never filed a bankruptcy petition that was not approved by the court. A 341 meeting of creditors typically lasts 5 minutes or less. It is not a court room. There is no judge, jury, or really anything you would associate with “court”. Honest debtors are literally out the door in a matter of minutes. Search the words “bankruptcy”, or “filing for bankruptcy”, or even “Rhode Island bankruptcy lawyer” on the internet and you will discover a subject surrounded by a confusion and misinformation. However, if you are drowning in debt, it becomes crucial to separate fiction from fact. Is bankruptcy as bad as your creditors would have you believe? Let’s analyze a few of the charges leveled at bankruptcy to find the truth. Nothing could be further from the truth. Despite what you may have heard from the press, this claim is completely unsupported. In reality, you can do almost as much (and in some cases, more) under the new law as you could under the old law. Many clients are actually making out better under the new law than they did under the old. This is another falsehood. The average person can obtain a financial fresh start without the world ever finding out: chances are the only people who will know about your RI Chapter 7 filing are the people you decide to tell. Although it is true that your bankruptcy is a matter of public record, the number of bankruptcies filed yearly is so massive that the possibility of anyone knowing you filed is extremely remote. It is crucial to note the importance of not telling others of your bankruptcy filing. Like divorces and cancer, financial problems makes good gossip, and if you tell one person, you tell the world. Unless you actually want your friends and family to know you filed for bankruptcy, keep it under your hat. Most of my clients don’t lose anything. Every state, including Rhode Island and Massachusetts, has its own set of exemptions that protect various kinds of property under bankruptcy. For example, Rhode Isand’s exemption laws protect a person’s house, car, truck, household goods, furnishings, retirement plans, IRAs, wages, personal injury claims, and cash value in life insurance. In most cases, creditors will not require the signing of a reaffirmation agreement to keep secured property. Even if you have more property than can be covered by available exemptions, filing for the slightly-more-expensive Chapter 13 bankruptcy allows you to keep your property. No matter how many people believe this myth, it too is untrue. If anything, bankruptcy actually helps you get back on your own feet financially. In the future you will be able to buy, own, control and possess whatever you can afford, and if you are able to come up with the money for it, there is no law preventing you from buying homes, cars, trucks, equipment, household goods, et cetera. The opposite is true: filing for bankruptcy leaves you in a better position to get credit than not filing. This is because filing for bankruptcy eliminates debt. Once your debt is behind you, you look more attractive to banks and credit card companies. In fact, it probably won’t be long before you start getting credit card offers-which is a mixed blessing because you don’t want to get right back into debt all over again. Banks, credit card companies and other lenders might charge you higher interest rates at first, and will demand more money in down payments, but if you are financially responsible and keep your job, the quality of your credit will only improve as time goes by. In most cases, if a client has not re-established good credit after 3 years, it is not because he filed bankruptcy; something else must have happened to disrupt his credit. On the contrary, filing bankruptcy is a sign of financial responsibility. Filing RI bankruptcy helps remove certain debts so you can take better care of your family, freeing your loved ones from the constant threat of unpaid bills and harrassing bill collectors. Over 750,000 families file for bankruptcy relief every year. The majority of these are industrious, honest, law-abiding people who have simply fallen on hard times-whether it be job loss, family emergencies, medical difficulties, failed businesses, or otherwise. Bankruptcy laws were created with such unforeseen circumstances in mind, in order to allow families trapped under crushing mountains of debt to make a fresh start for themselves. To believe this myth is to confuse two entirely different concepts. The fact that a bankruptcy filing is reported on your credit report for up to 10 years does not mean that you will have no credit, or bad credit, for 10 years. In reality, filing for federal debt relief might not actually have a negative effect on your credit score at all. Generally speaking your credit is already a mess-or maxed out-by the time you make an appointment to see a bankruptcy attorney. More than likely you have very little or no credit for bankruptcy to hurt. Thousands of cases exist in which husbands or wives filed for bankruptcy separately from each other. While it is sensible for a husband and wife who both have a lot of debt to file for bankruptcy together, doing so is never a legal requirement. If there is not enough debt in both spouse’s names, I will only file for the spouse who actually needs help. With an experienced bankruptcy attorney, filing for bankruptcy is far from difficult. In all honesty, the most difficult part of filing for bankruptcy is making the decision to do so. After that decision is made, filing bankruptcy in Rhode Island should be a straightforward process. Most who file consumer bankruptcy do so in order to protect their family from financial ruin. The majority of people who file for debt-relief are hardworking individuals who resort to filing as a last-ditch attempt to deal with large bills. Life-changing experiences like divorce, job-loss, failed businesses, illness, and unforeseen emergencies can happen unexpectedly. As a step to free your family from crushing debt created by these events, bankruptcy is a noble act. Compare this to the real definition of a deadbeat: someone who lets himself get deeper and deeper into debt each year, allows creditors to abuse him, and pays his hard-earned money to those creditors while his family suffers. His house falls apart, his car falls apart, his life falls apart, his family falls apart. He doesn’t seek to fix his situation because he doesn’t care. “Deadbeats” don’t file for bankruptcy: financially responsible people who care about their families do. The moment you file bankruptcy, an order called the “automatic stay” is issued by the Rhode Island Bankruptcy Court. This order is a grave warning that tells your creditors to leave you alone. The automatic stay prohibits you from all collection actions and even prevents your creditors from being allowed to talk to you. Creditors must cease all new collection attempts and halt all collection attempts they have already started. Their failure to do so gives you the right to take your creditor to court. Bankruptcy Court Judges are not friendly to violators of the “automatic stay.” In essence, creditors can either leave you alone or suffer the consequences: many Bankruptcy Court Judges have been known to issue severe punishment on offending creditors. Think about the peace of mind you will have once you file for bankruptcy protection. No more collection letters, phone calls, repossessions, lawsuits, or threats of foreclosure from hungry creditors. You are protected by the “automatic stay”and have the full force of the bankruptcy court system backing you. Filing for bankruptcy does not cause family troubles-not being able to provide for your family does. Stress and anxiety in the family are the products of the symptoms, not the cure. When unpaid bills loom, creditors can knock at the door, and nothing can be done about it. In this environment, families will experience tremendous levels of pressure. If this pressure is allowed to continue for long, it can lead to family rifts and even divorce. Bankruptcy, by its very nature, is designed to remove this pressure by destroying debt. Once the burden of debt is removed, stress lowers and your family can breathe easy again. Filing for bankruptcy can be an important first step in re-building relationships strained by financial hardship. Under Chapter 7 bankruptcy law, you can get a “discharge” once every eight years, allowing you to file for debt relief again if necessary. The wait is even shorter under Chapter 13, where it is only six years. Unfortunately, this is not only impossible, but illegal. You must list all of your property and all of your debts when filing for bankruptcy. One of the prime reasons people want to leave out a debt is because they want to continue paying it off. However, the same result can be achieved under bankruptcy. Bankruptcy does not prohibit you from paying back whoever you like. In fact, in some cases you need to continue paying certain debts under bankruptcy-if you want to keep cars, trucks, or houses you owe money on, for example, you must continue paying off your debt. You are protected under law and are able to keep the property for as long as you stay current on these loans. Bottom line: Knowledge is power. And in these days of financial instability, economic turmoil, and rampant debt, knowledge about your financial options is crucial to keeping your family and possessions secure. Wouldn’t you prefer to know the truth about bankruptcy than remain in the dark about your options? Before you come to your own personal verdict, make sure you know enough information to make a responsible decision. The sad truth is that myths and ignorance are a creditor’s best friends. The Rhode Island Bankruptcy Court is located at 380 Westminster Street, Providence, Rhode Island 02903. 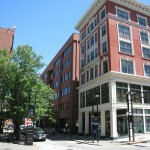 It is on the sixth floor of the Federal Center which is a red brick building. There is plenty of parking outside the buiding and it should cost about $ 8 for 90 minutes. Upon entering the Federal Center building, keep to the left. There is a metal detector and security checkpoint to go through. After going through security, you can then take the elevator to the sixth floor. Take a right off the elevator and through a second security checkpoint before gaining entrance to the Rhode Island Bankruptcy Court. As stated in a prior blog, most clients who file a Chapter 7 Rhode Island bankruptcy don’t have to actually go into the Rhode Island Bankruptcy Courtroom. They are required, however, to attend a 341 meeting of creditors. This meeting of creditors is where the debtor is asked a series of questions by the assigned bankruptcy case trustee. Please note that the 341 meeting of creditors is also held on the sixth floor of the Federal Center, but is not a part of the bankruptcy court offices. Just be sure to take a left when getting off the elevator. The hearings are held in Room 620. Upon entering room 620, there is a waiting room for clients and bankruptcy lawyers as they wait for their case to be heard. You should plan to arrive 30 minutes before your scheduled hearing to get situated and to ask any final questions of your bankruptcy lawyer. You will be surprised how quickly your case is heard. Five Rhode Island bankruptcy cases are scheduled during a 30 minute block. For more particular information, feel free to visit the US Bankruptcy Court website for Rhode Island and directions can be found using Google Maps.